This little piece of software can browse, edit, and empty your Safari icon cache. 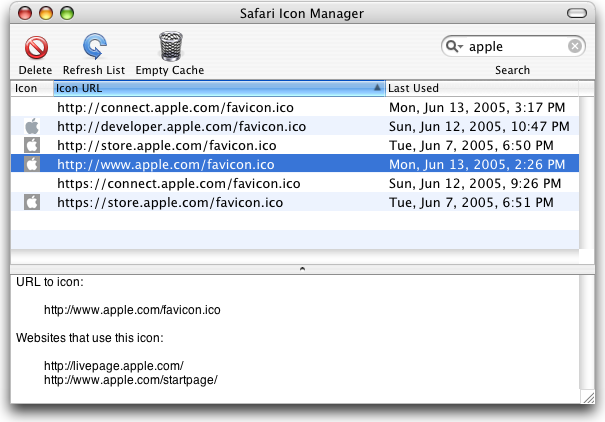 Safari Icon Manager 1.1 is compatible with Mac OS X versions 10.3.9 and up with Safari 1.3 and higher. Note: Safari Icon Manager is not currently compatible with the Safari 3.0 beta. The icon cache has been entirely redesigned in Safari 3.0, so I need some time to get Safari Icon Manager working with the new format. - Can now download the latest version of icons. - SIM is now a universal binary for Intel compatibility. - Double-clicking an icon now takes you to the directory on the website containing the favicon.ico file. - The URLs that appear in the bottom pane of the main window are now clickable. - You can now copy icons and paste them onto icon URLs. - Dragging and dropping icons between icon URLs works. - Now makes use of open source WebKit code released by Apple, resulting in major speed gains and feature enhancements which were previously not possible. - Added a date column which uses Safari's history. - You can set custom icons now by dragging an image file onto an item in the icon list. - Added a search feature. - The help menu item now works, and the Read Me file was removed. - Multiple icons can now be selected for deletion. - The icon list can now be sorted. - Now indicates when the application is busy loading the icon cache. - Added a refresh button to refresh the view of the icon cache. - Brings compatibility with Safari 1.3 and 2.0. No longer compatible with past versions. - Updated the Read Me with the new site address. - Can delete individual icons and empty the entire cache (once again!). - Includes a Read Me. - Now compatible with Safari v85. Should be compatible with Safari v73 and higher. - This is a mainly useless version - it can only browse the cache. If you get a crash, please report it to doug@ircandy.com and send your ~/Library/Safari/Icons folder if possible. Thanks! I'm trying to polish out the icon-getting section of the code. - Can now generate HTML code for adding an icon to your site. - Now localized for Japanese (thanks HikoSoft!). - App strings now modularized for easier localization. - Icons of web pages with an already existing icon can be edited now - just drop an image file or clipping onto the previous icon inside Safari Icon Manager. I am looking into adding support for setting custom icons for sites that don't have an existing icon, but it is currently impossible for me to implement unless Apple tells me what the numbered folders and filenames inside the main icon cache folder mean. - This app now has an icon of its own! - It is now possible to delete individual icons from the cache without erasing the entire cache. - There is now a text area under the table view that shows what web sites are associated with a particular icon. - Removed next and previous buttons, replaced them with a table view. - Enabled drag and drop and copying for the icons. What exactly is the Safari icon cache? The icon cache is a set of files that contain the "icons" for sites you have visited. These icons appear in your History menu and Bookmarks menu, as well as in the address bar. They are also known as favicon.ico files. What's the point of this program? It seems kind of obscure. True, it does seem pretty specialized for a minor detail in Safari. The reason it exists is simple: Safari doesn't update its icons. If someone changes the icon on his or her site, Safari won't see the new one. You can delete the entire icon cache by hand, but that wipes all the other icons as well. Safari Icon Manager can selectively delete icons from the cache, forcing Safari to re-download an icon. The other cool thing you can do with this app is set locally-stored custom icons for sites (including sites that don't already have icons). How do I use Safari Icon Manager? First of all, if you are going to modify the icon cache, you should make sure Safari is closed. Open Safari Icon Manager after closing Safari (in case Safari has modified the icon cache). Find the icon (or blank dummy icon) that you want Safari to look at again, and highlight it in the list. If you want to search for an icon, you can type a search string into the search bar in the upper-right corner of the window. Click the Delete button in the toolbar at the top of the window. Quit Safari Icon Manager. Go to the site again. Safari will download the latest version of the icon, if one exists. What are all these URLs without any icon in the list? These are dummy icons for sites that don't have a favicon. Safari does this so it won't keep checking for a favicon every time it visits the site; it will only check the first time. To force Safari to check for a favicon again, just delete the dummy icon from the list in Safari Icon Manager, and then visit the site again in Safari. What is the list of URLs in the bottom pane? These URLs are the addresses of all the websites you have visited that use the icon that is currently highlighted. For example, if you have a website http://www.blah.com/, your favicon file is probably located at http://www.blah.com/favicon.ico. All of the pages on your site use that same icon, so they will all be in the list. Can I use Safari Icon Manager to set my own custom icon for a site? Yes. You can only change it by icon, though, not by site. So if many websites use the same icon, when you change the icon, all of them will use the new icon. To change an icon, drag an image file from the Finder over the icon you want to change in the list. I want to copy over an existing icon that one site uses to another site. How can I do this? As of version 1.0.1, you can drag icons from one item in the list to another to copy them. You can also copy an icon (Edit->Copy), highlight the icons you want to change, and paste (Edit->Paste) to copy icons over. I copied some of these "dummy icons" you mention above to other sites. Safari shows these sites with no icon instead of the default blue globe icon, and Safari Icon Manager doesn't put them in the correct order when sorting by icon. This is because when you copy the placeholder icon, you're setting the actual icon stored in the cache to the placeholder rather than telling the cache that there is no icon. Right now, there's no workaround, but it is recommended to simply delete an icon and revisit the site that uses it if you want to reset it. The real way to fix this "problem" is to not allow copying of the placeholder icons, and instead, provide a button or menu item that will set sites to have no icon. This feature may be included in a future version of Safari Icon Manager. Can I get Safari Icon Manager to check to see if all my icons are up to date? Yes and no. As of version 1.1, there is now an Update feature that will update your icons. Safari Icon Manager will replace the icon you currently have set with the latest icon that was obtained directly from the web server. If there isn't an icon on the web server, it will leave your current icon alone. Help! I deleted my site's icon from Safari's cache using this tool, and then I removed my .ico file from my web site. Then, I visited my site without any icon. I stuck an icon back into my web space, and Safari still thinks there's no icon! Go back into Safari Icon Manager and find the blank icon that corresponds with your site. In the list, it will appear as http://www.your-domain.com/favicon.ico. Delete it. The next time you visit your site, Safari will look for an icon again. If that doesn't work, you need to delete Safari's regular cache. In Safari, go up to the Safari menu and choose Empty Cache. Help! Safari Icon Manager crashes when I click the Delete button, or it crashes when I first start it up! There are three possibilities: One, your Safari icon cache is corrupt, two, you are using a newer version of Safari that has changed the format of the cache, or three, you've found a bug in Safari Icon Manager. If deleting Safari's icon cache manually (delete the folder ~/Library/Safari/Icons/) does not fix the problem, then you should contact me at the address listed at the bottom of this page with more information. I used your app and Safari no longer starts up! You should be able to delete the folder ~/Library/Safari/Icons/ to fix this if for some reason Safari Icon Manager has corrupted your cache. Right now, no known cases have been reported, but I'm providing this for your information if it does happen. Can I use Safari Icon Manager to create a .ico file? At this time, it is not possible to use Safari Icon Manager to create a .ico file. However, I am looking into it as a possible feature for the future. For now, you can use GraphicConverter or Iconographer for your .ico file needs. I added code to my page for a favicon, and the icon works in the Mac browsers, but Internet Explorer for Windows just won't display it! Well, there are a number of things you could be seeing. IE started the favicon craze, and notice that it's called a favicon. The icon only appears when you've added the site to your favorites, and even then, it only appears in the Favorites menu. If it's still not appearing, then you should make sure that your icon is in .ico format. The Mac browsers that support favicons, such as Safari, support some other formats like .gif or .png. I don't trust this app! What exactly does it do? The delete individual button deletes an icon file from the appropriate section of the Safari cache folder, and then modifies one other file inside that folder to notify Safari of the change. The Empty button deletes the folder (and folders/files inside): ~/Library/Safari/Icons/. That effectively clears your entire cache. I am not responsible for any harm this software does to your computer. Use at your own risk! Portions of this program make use of WebKit source code written by Apple Computer, Inc., acknowledged below. Copyright © 2005 Apple Computer, Inc. All rights reserved. Neither the name of Apple Computer, Inc. ("Apple") nor the names of its contributors may be used to endorse or promote products derived from this software without specific prior written permission. By Doug Brown. Last modified 6/18/07.